Worrying can literally causes us to come up short on living this life and enjoying everything it has to offer. So when it comes to how to stop worrying, we need ways that we can use that are practical enough to be implemented fast. That give us fast results. But what are the best tips for stopping worry from ruining our lives? Well below I go into the best tips on the face of the planet. Along with looking at why we worry. Showing us why we do so and how to stop worry in our daily lives! The first step to stopping something that we want to stop doing or know we need to stop doing is to figure out WHY we we are doing so. For example if an alcoholic wants to quit drinking, then he or she needs to identify why they are drinking. Once they identify the reason(s) they are doing so, they can start to take proactive measures in eliminating these reasons from their life to ultimately lick the habit of drinking. If we do worry we will never be blindsided by a surprise we didn’t see coming. But we need to realize that we can’t forsee everything. Life would be incredibly boring if we did. There is safety in worrying. We think it lowers the likelihood of what we are dreading actually happening. If we don’t worry we are inviting trouble into our lives. We think it shows we care. We think if we don’t worry, we don’t care or will look like we don’t. This causes us from taking proactive measures to ensure the things we are worried about won’t happen though. To curb this, ask people in your life if they think that if you didn’t worry about them they would see you as uncaring. Almost always, the answer is no. We see worry as motivating us. If we don’t worry about stuff we will become complacent and not get anything done. Instead we need to worry constructively instead of engaging in unproductive worry. We think it helps us solve problems. We think we will only find solutions to our problems though worrying about them. When we worry our way to finding solutions, we are cutting off our ability to think creatively and use creativity to solve problems in our life. So these are the main reasons that show why we worry. What makes us do so and how we think it is helpful to us. So when it comes down to it, there are ways to worry in which it is in a constructive manner. Not in a sense of the word that we are used to where it is erratic and disempowering. 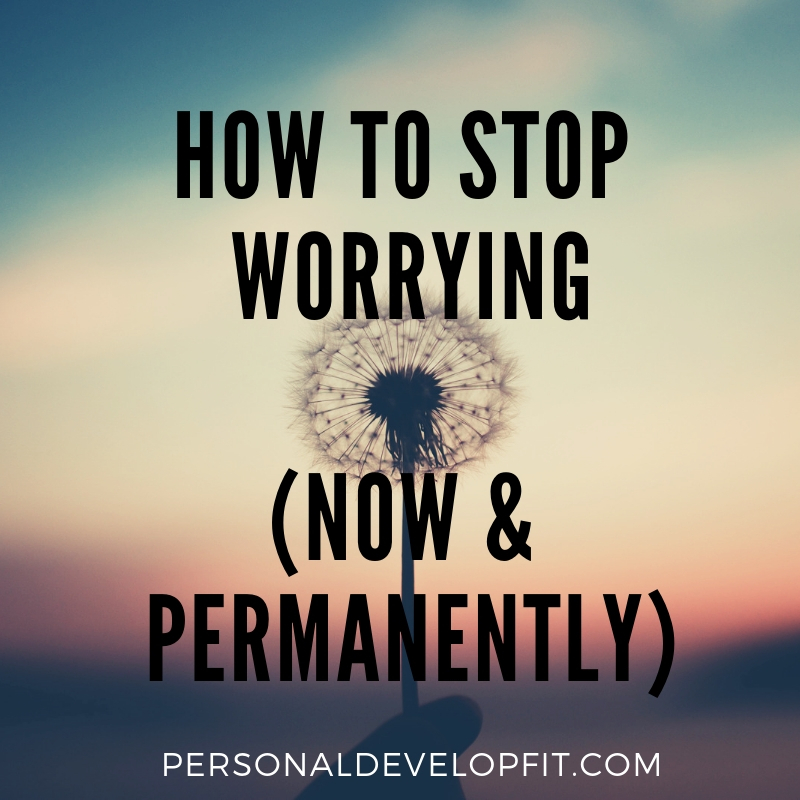 Below I show you ways to either worry constructively as well as stop worrying in it’s tracks. Allowing you to stop worrying and take proactive measures towards putting yourself in a more courageous state of mind. Leaving worrying behind for good. The fact of the matter is that we need to see how ineffective and non time efficient worrying is. It is simply a waste of time to worry as it really doesn’t do anything positive for us. Worrying is such an ingrained habit in us. It was very efficient for us in an evolutionary sense when we really needed to worry and contemplate on the worst case scenario when we were living amongst beasts that could tear us apart. But nowadays we don’t need the mindset anymore. We don’t need to default to the worse case scenario. It is not helpful at all and is one of the biggest causes in our short and long term stress and anxiety. So to break this habit, we need to replace it with a good habit. One that is beneficial for having us move forward in a progressive way and not let worrying be the cause of our self destruction. So in order to break this habit, it is imperative that whenever we catch ourselves worrying about the worst case scenario, we need to immediately dwell on everything positive that could come out of the scenario that we are worrying about. Every time we do this, it will start to reset our default mechanism of thinking negative and worrying about things that haven’t and may never happen. The more you do this, the more positive and worry free you will become. Literally envision the perfect scenario that you would love to come out of the thing that you are worried about. Create multiple images in your head about the perfect scenarios happening. This will put your worrying at ease. Along with show that you are the master of your own mental imagery. When we worry, we are robbing ourselves of time we could be using to do something productive. It is a disruption to our peace of mind. If you are going to worry, simply allow yourself time to do so right before the thing you are worried about is going to take place. For example right before a test or a date. Put your feelings of worry aside. Worrying about something in the future is not progressive or beneficial right NOW. Leave it for later, if at all. It is said that if we are worried, than we are living too much in the future. In order to stop worrying, bring yourself completely in the present moment. The more you can be present, the happier and less stressed you will be. Simply live in the NOW. When we worrying, we are literally robbing ourselves of minutes, hours or even days of our lives that we will never get back It is a waste of damn time! When you start to worry, quickly remind yourself that you are dying literally. Every second counts. And worrying is robbing you of the precious time that you have on this earth. Often times it helps to get a visualize of the negative things that are happening to us when we are doing something in order to move away from it. Worrying doesn’t just affect our current mood or stress levels, it affects much more than that. An article by WebMD talks about the long term affects of chronic worrying talking about how it can interfere with your appetite along with crush relationships, affect your sleep and worsen your job performance. It can lead to under-eating causing symptoms of malnutrition. It can also lead to overeating which can cause one to be overweight which can lead to a host of horrible side effects from a crushed self image to major health implications. It can also causing us to age prematurely, cause digestive disorders, muscle tension, premature coronary heart disease, short term memory loss, weakened immune system and even heart attacks. The fact of the matter is is that no matter how much worry we engage in, it isn’t going to allow us to manifest a better situation out of what we are worried about. What is going to happen is going to happen. If we realize this, we are more likely to stop worrying. Every time you start to worry, remember all of the bad things that can come out of worrying. Like the things I talked about above. 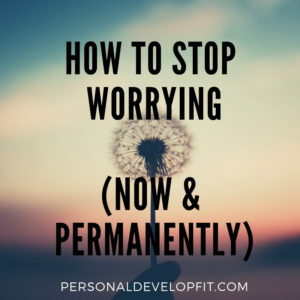 This can stop you and I in our tracks and stop worrying about what the future brings as we value our good health over worrying about something. Also think about the people who rely on you the most. The people you are going after your goals and dreams for. And simply living for. Realize that they need you to operate at your best. And worrying will not allow you to do so. We have all been in the spot where we get done with something we were incredibly worried about then ask ourselves “Why the hell were we SO worried about that??”. It has happened countless times in our life and is almost the same out come of almost every scenario we go through in life that we are worried about. When it comes down to it, the worst case scenario rarely happens! So knowing this, we can stop worrying as the odds are and percentages show that everything will most likely be OK! Just know this when you start to get tangled up in thoughts about worry. Just gently remind yourself that everything is almost always going to be OK, just as it has been in the past. I know for myself, in the past sales person, I would worry about things going wrong with prospects. I would worry about them giving me objections I couldn’t handle. Me drawing a blank and looking like an idiot or simply even being late to the meeting or they not seeing the value in me that I saw in myself. Whatever the worry was, I could have been spending time preparing for what was to come. The more we prepare, the less we worry. We either prepare for success or fail to prepare for success and fail. When we prepare for success in the things we were previously worried about, we both crush feelings of worry along with don’t give ourselves anytime to do so. So next time you are feeling worried about something, ask yourself “What are 5 things I can do today to be better prepared for the thing I am worried about?”. Asking yourself this will give you answers and insights that will start to cure your worries and let you feel more proactive and well prepared for when this situation or scenario comes up. So that you can act like a leader and winner when it does and not like a victim to it. If you believe in God, you can then pray about it and turn it over or surrender it over to God. Surrender all of your worries and thoughts over and notice how much better you feel. Also if you are not religious, you can meditate your worries away. Either tactic allows you to quiet down your mind. Which is the original source of your worries. When we can get even a little control over our minds and learn to master it, we can become more worry free. There was a study done that showed how new research shows mindfulness meditation to help with worrying. The study talks about how they enlisted the help of 77 participants, of which the researchers examined what type of impact 3 different styles of mindfulness meditation techniques would have on how often one experienced intrusive thoughts. The researchers also measured subjective anxiety levels. Out of all the techniques, the best one for lessening the amount of intrusive thoughts was the guided acceptance based mindfulness meditation. This style allows your thoughts to be brought up into your mind in which we both observe them along with acknowledge them. The goal for the meditators was to simply turn their attention inwards, acknowledge the thoughts and not judge them, let them be as they are. The study showed that just one session did reduced the frequency of negative thoughts, although anxiety levels did not dip. But the positive fact is that simply just by one ten minute session, people showed less negative and worry thoughts. The possibilities could be endless if one engages in daily meditation. I know for myself, I have been meditating off and on for about 2 years now. Which one of the original reasons I started was to become more worry free. For myself, after a while, I would notice that I would start to default to the positive and I truly do have less thoughts about worry. Or often times they just aren’t as loud or aggressive. Both thoughts and feelings. Just because our mind is telling us what to worry about doesn’t mean we have to listen! Ask yourself “Whose mind is this?” and of course the answer will obviously be that it is YOURS. When I do this, I always say “Oh yeah! It is mine!”. This allows the mind to realize what place it plays in our lives. It is almost like telling a dog to shut up when it is barking or shushing a crying child. They think they are your master or that they are the adult and are running things. But when you shut it down, then you simply remind them who is boss and they remember who their master is (or parent is!) so to say. One of the biggest ways to grow is to see your thoughts objectively without reacting to them. We don’t HAVE to react to them, we are just so primed to do so as we have been doing so all of our lives. But when you start to worry, simply remind yourself whose mind it is when it is trying to get you to engage in worry. This will let you tighten the reins on your mind very quickly! Brian Tracy, personal development author and public speaker talks about how when we are worried, we should immediately think about our goals. You cannot be worried about anything when you are thinking about the goals you have for yourself. When we look at more of the long term view of ourselves, we stop getting caught up in the little things. We forget about our present worries and bring into our heads empowering thoughts about how we see ourselves and feel ourselves being when we accomplish our hearts goals and desires. It allows us to live in the future of possibilities instead of a future of negative things that COULD happen that are causing us to worry. This has helped me a lot in my life. A great way to obliterate worry right on the spot. The thing about worrying is that we are thinking all about ourselves. Which is very normal so don’t beat yourself up about this. But the thing is that if we just take the awareness off of ourselves and start putting it on others, we can forget about our own selfish desires. The best way to do this is to think about the people you are most grateful for. Simply say it in your head, write them a letter or call them. By giving them gratitude, you are replacing a very low vibrating energy with a high vibrating energy. Swapping worry for gratitude will allow you to feel one hundred times better, safer and more powerful. Along with forget about what you were worried about. Often times we will worry about what other people think about us and think those thoughts are valid and actual thoughts those people are thinking. Well most of the time they are not. They are just our own securities that are speaking. I am not saying that we can sometimes tune into what people are thinking through our intuition. But most of the time this just isn’t the case. So either dismiss these thoughts or let the thoughts go. Believing our own thoughts about what we think other people are thinking about us cuts us off from really shining in a way we want to. By not listening to them or really giving them any power, we can move forward in a more confident way. Also remind yourself that even if these people are thinking these things, so the hell what?! It means that they are not good people to be in your life. Or sometimes you and I feel as if you we are picking up on something that someone is thinking about you and it hurt our feelings. Often times because it is true and it reflects a weakness we have. At this point, do not feel insecure about it. Just remind yourself that it is something you need to work on and get better at. This way you will see it as something you can grow from. Not a deal breaker or something people will always think about you. Taking this approach is taking a winners mentality into situations. We all have things we can work on and get better at. When we pick on up someone’s thought that is causing us that insecurity, it is just a way to create a better us through. So see it as them helping you instead of as a personal attack. Also, instead keep your radar on for sensing the good things people are thinking about you. Hone in on those and allow you to only think and operate from them. Use it to your advantage. If you feel as if they like your smile. Smile more and more. If you think they like your positive outlook, keep bringing the positivity. And leave what you think they are negatively thinking about you behind. . I wrote about his in one of my other articles in which I talked about how worrying and excitement are essentially cut from the same cloth. According to an article by Greatist anxiety and excitement involve the same chemical mechanisms in the brain. And according to a Doctor of Psychology of Ambrosia Treatment Center Sal Raichbach talks about how the only thing that separates these two emotions is simply the associations we make with them. We recall our previous experiences with similar scenarios in which we link to things that either worried and caused anxiety for us. Or things that excite us. The thing to do is link images from your past that support the things you are about to do. For example if you are worried about doing a public speech, then go back to a time where you had some type of success in public speaking. Instead of times where you may have forgot your words or dropped the ball in some way. Reinforce these feelings with good images of the past where you had success. Then actually see these feelings of worry, not as worry but excitement. This shift in mindset can alter your existence on this earth. Because worry is a feeling of inhibition and lack. Whereas excitement is a feeling that propels us forward. We are interested about what is to come and are thinking about all the possibilities and things that can GO RIGHT and the good things that will come out of those things going right. Life altering! The same article also references a study that concluded that when we look at anxiety as excitement, we literally perform better. Regardless of what task we are engaging in. That means you can do better on first dates, public speaking, sports events, sales calls, meetings. Whatever! The best way I have ever found for crushing worrying in it’s tracks is to simply hit the weights/gym. Getting our heart pumping and muscles working puts our emphasis on our bodies and not our minds. It is one of the best ways to channel any unwanted feeling and do something productive with them. It puts all of your energy in the gym building instead of thinking about all the things that can happen in the real world so to say. It allows you to create your own positive world. Then feel empowered to go out and crush challenges in your day. Swapping worry for feelings of courage and competence. At the end of the day, the possibility does exist that the absolute worst case scenario can happen. I am not saying that we need to dwell on this fact. I am saying that we need to create a plan for if it does as it can help you face all of your fears. When we face our fears we can conquer them. So say we do a public speech and completely bomb it. That is the worst thing that can happen in this scenario. Well then we can ensure ourselves that we will never do this again by knowing that there are things like Toastmasters to help us master public speaking. Or classes and courses we can take to ensure that we bring a more polished self to the stage next time. Simply facing our deepest fears will allow us to really examine the DNA of our current worries. As they are all stemmed from a deeper fear than what the originally manifest themselves as. Once we dig out the root causes, the rest of the small fears will die away. Leaving us with new ground to fertilize hope and courage under. We need to realize that no matter what, good and bad things are going to happen to us. Life is neither always good or always bad. Sunny days follow rainy days and vice versa. Life is always balancing itself out. We can work on ourselves and prepare ourselves to have mostly good things happen to us. But at the end of the day there will be things that happen to us that make us question – “Why us?”. Because we are human, that is it. Life hands us a certain amount of suffering. And how we handle and overcome that suffering makes us who we are. But worrying about bad things happening won’t cause them to still not happen. Again bad things will happen. So just accept that life will have it’s problems and know it won’t stop them from happening from worrying about them. So why worry right? When we worrying about something, we are believing in our lack of ability to properly handle something. So instead of worrying about something, identify what things will help us become better to be able to better handle these situations in the future so that we don’t worry as much or at all about them ever again. Because we will be more physically, mentally and emotionally prepared. Preparation breeds success. You can beat people if you are more prepared but less talented. Realize the power of preparation and always find ways that will allow you to be more prepared, then act on them. This will allow you to get rid of your worries. When we think about it, life is so damn short. So worrying about things is robbing us from enjoying the good things that are actually in our life. So instead of worrying, think of the great things that are in your life and feel appreciative for them. Whenever we engage in acts that we really love doing, there is no room for worrying. Whatever it is you love doing, do so when you are worried. Even if it is only for a few minutes. It can be just enough time to put the worry to bed for good. At the end of the day, any worry we have, someone else had had the same worry and found a way through it. Although when we have worries, we tend to feel as if we are the only ones that have them. This is OK because it feels very personal to use when we are caught up in the emotion and thought that is creating the worry. But we need to realize that we are not alone in these worries. And if someone found a solution to the problems we are facing before us, then we can do the same. That we are going to be OK. Realizing this can put our mind at ease. When we are worried we are simply stalled. We aren’t taking any action, which is when worry creeps in. But if we are constantly in action and moving forward then we can quell feelings of worry with more ease. Just keep moving! Whether it is taking action on something to help ease our minds about worrying. Or taking action on doing something trivial like taking the dog for a walk or clothes to the dry cleaner. Simply get your body moving. You can literally journal your thoughts about anything in this life to help you feel better about things in your life. The same holds true with worrying. A great article titled How to Start a Worry Journal talks about how we should create a journal simply for our worry thoughts. The article suggests that we write in in 30 minutes a day, which I think is excess, but in actuality we may need only 5 one day and an entire hour another day. Next you want to write out your worries on the left side of the paper then on the right side you want to put down all the ideas for resolution pertaining to each of these worries. Then you simply close the book and put it out of site so you don’t look at it again until your next journal entry. We should also do this before bed. This is because we will be able to clear our head right before we go to sleep to help us sleep better. As when we are sleep deprived that just contributes more to worry and anxiety the next day. A study was done in the Journal Anxiety, Stress and Coping which the participants, all who were classified as chronic worriers, were told to write out 3 potential outcomes that could come out of the situation they were worried about. After they had the 3 written out, the researchers evaluated the outcomes for how practical they were and solution based they were. The link between problems and elaborations was shown to be that the bigger the worry, the less concrete solution would be given on how they would move forward with the problem. This showed the researchers that worry is a cognitive avoidance response and the worse the worry gets, the less likely one can act proactively or even think about creating a good solution to he worry/problem. We have all been in that spot where we have a problem and we simply keep putting it off. It could be as simple as something on a to do list we don’t want to do and keep putting it off. Or a talk we need to have about breaking up with someone. The more we put if off, the more anxious we feel and become. It gets worse and worse and at the end of the day this is us self inflicting these worry wounds. So in order to stop worrying, we need to take action on our problems when the worry is very small and in it’s infancy. This will allow us to take a proactive approach to it’s resolution. Also the more we attack our problems, the more we will prime our brain to do so more often and faster, almost seeking out problems to crush in our lives. When we start operating from this type of action, our lives will naturally be more worry free because we become problem solvers which boosts self esteem and gives us peace. I myself am a perfectionist. I believe that it can be one of the biggest traits to getting things done right and living a prosperous life. But often times it can be a source of anxiety and worry. So I have to monitor it. When I am so consumed with perfecting everything in my life, I have to cut myself some slack and allow myself to not have to be perfect or strive for it all the time. At the end of the day we are only human. We can only do things so perfect. If things don’t turn out as perfect as you want them to, simply harness the power of acceptance. Accept the things you can’t change and then learn from it and move on. There was a study done on how it showed what the comparison was to thought suppression along with an acceptance based technique in regards to the management of the intrusive thoughts we have. The study showed how simply accepting our intrusive thoughts lead us to be less likely to become obsessional along with give us lower levels of worry and anxiety. Compared to the people who suppressed their thoughts. Did you know that there is actually a disorder related to this topic? I kid you not, it is labeled as social media anxiety disorder. An article talks about the link between social media and anxiety and talks about how it is related to what is referred to as the compare and despair factor. An example of this is that you went fishing and caught a nice marlin that is garnering all these likes. But then I post a picture of me getting married in some tropical paradise. This leads to short term anxiety and even fear of personal failure. It creates a need in us for perfection and it especially needed to be seen in the eyes of others. This can lead even worse things like social anxiety or pervasive thoughts. This is a downhill spiral that you and I need to stop engaging in if we want to master our levels of worry and start to get rid of it. Swearing off using it in certain places like the bathroom, during commutes, at the movies or in bed. Buy an alarm clock and use it instead of your phone alarm clock so that you aren’t tempted to jump on social media right when you wake up. Get off for an entire weekend. It will remind you that life is pretty great not being glued to your social media accounts. It won’t be enough to cure your habit but it can give you a great break to where you can start thinking creatively as there are no distractions says life coach Louise Gillepsie-Smith. At the end of the day we need to SEE it as an addiction. The more we realize how addicted we are and how it is affecting our lives, the more we will take the steps needed to become it’s master instead of the other way around. I mean really, what are we missing out on by not looking at it? We are going to miss out at not seeing people ACTING like they have perfect lives but are really miserable. See thought this bull illusion. Also start monitoring what you are posting before you post it. What are your motives for posting? IF you are just doing it to show people how great life is treating you, refrain from posting it as you are just becoming part of the illusion. Making it harder to break free. Instead of posting it to the world, maybe just send your pic to a friend. Or per say it is about a trip you took, journal out how great of a trip you had and all the things that made it so wonderful. I think that affirmations can be great at putting in our mind in a better state for whatever we want in life. Including worrying. The act of repeating something over and over will soon make our subconscious mind start acting on it without us having to put much effort into it. Chronic worries often ask this question, sometimes without even knowing it. This leads us down the rabbit hole, finding things we don’t want at every turn. When you catch yourself asking this, simple stop yourself. Or laugh at your fears of what come up when you ask “what if?”. So what IF it does happen, that doesn’t mean it is going to! It is silly when we think about it as we think it is going to happen if we ask that question. But in actuality most of if not all of our “what if’s” never come true. Scheduling a 15 to 30 minute slot to do so each day for one week. Preferably in the afternoon but not before bed as this will affect your sleep cycles. Write down in this time everything you are worried about. Without putting pressure on yourself to solve them. Which during this time you know that you are dedicating only this time to these worries and won’t think about them as much as you can after this time slot is over. During the day, if these worries come up, which they most likely will, simply remind yourself that you will have the 15-30 minute time slot the next day to think about them. At the end of the week look at all you have written down. Notice patterns or repeat worries and reflect on these, honing in on the top 5-10 worries that keep coming up. After this week is over, try it for another week if you like it. It will help us prime ourselves for controlling when and where we worry. Letting it not affect us in any other situation or scenario. “I’ve noticed that worrying is like praying for what you don’t want to happen.” – Robert Downey Jr.